Carlos recently picked up this book about Mid-Century designer, Alexander Girard, at an estate sale. It is a 15 pound 672 page compilation of everything Alexander Girard created in his lifetime, curated by Todd Oldham and Kiera Coffee and published in 2011. It includes his interior design, furniture design, images of textiles and wallpaper, sketches, folk art, interviews, and more. I would definitely recommend this book to any Mid-Century Modern collector. We have been especially curious about the life and work of Alexander Girard since we acquired these vintage Mid-Century bar stools with ‘La Fonda’ seats (the bases on these stools are Herman Miller secretarial stool bases) that were designed by Charles and Ray Eames in collaboration with Alexander Girard for La Fonda de Sol restaurant that opened in the Time & Life Building in New York City in 1960. Set of four vintage Mid-Century stools with 'La Fonda' seats by Charles and Ray Eames and Herman Miller secretarial bases (model EC123-36), offered at Mid-Century Modern Finds. 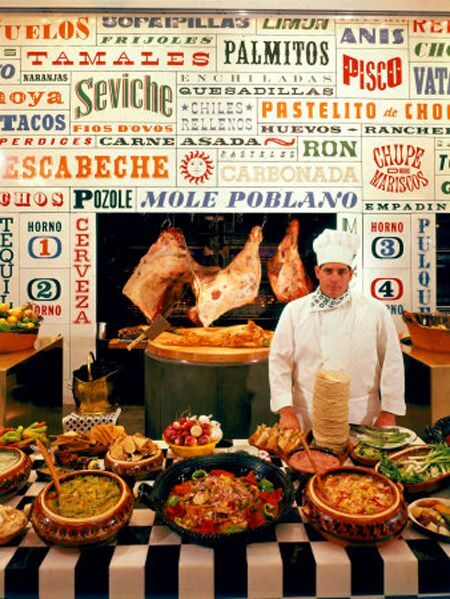 Alexander Girard designed every aspect of the Latin American themed restaurant from the matchbooks and menus to the space planning, tableware and waitstaff uniforms. Charles and Ray Eames were friends of Alexander Girard and were asked to design the 'La Fonda' chairs. They were similar to the Eames fiberglass shell chair, but Girard requested that they be lower, so that the tables could be seen. La Fonda del Sol had a meandering layout that Girard used to create separate spaces for the customers to enjoy, a combination of open lively spaces and enclosed seating, staggered niches containing pre-Colombian artifacts and folk art mixed with modern chairs and tables and bold, colorful typeface on the walls. Alexander Girard created an exuberant experience with his design of La Fonda del Sol that contrasted with the conservative modernism of the time. 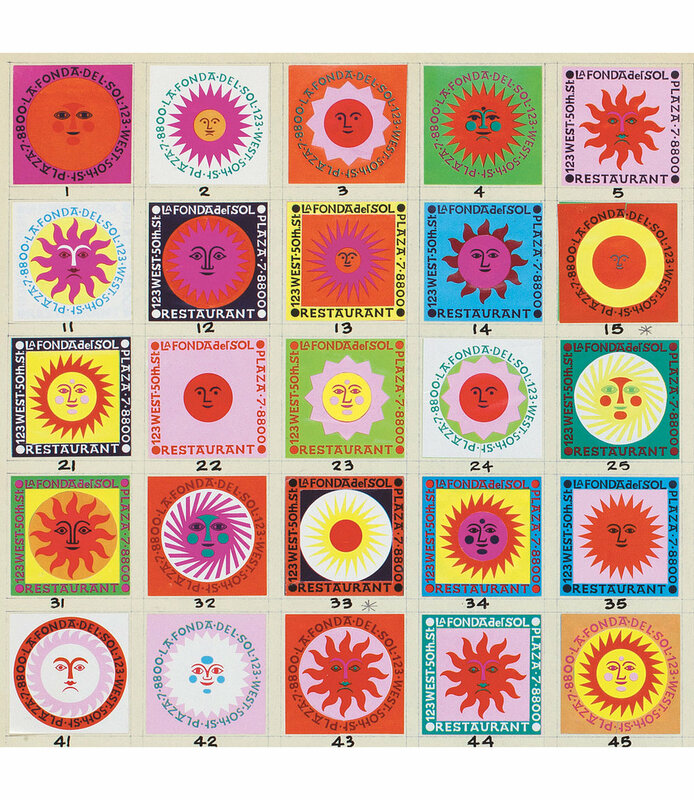 Alexander Girard had a love of folk art that he was able to explore and celebrate in his design of La Fonda del Sol. He created over 80 sun motifs used throughout the restaurant on menus, matchbooks, carts, waitstaff jackets and more. Throughout his life, Girard and his wife, Susan Needham, amassed a large collection of folk art that they displayed in their homes in Santa Fe, New Mexico. 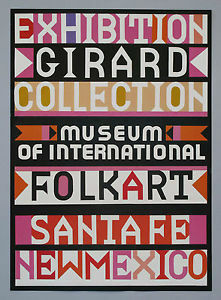 They also donated over 100,000 pieces to the Museum of International Folk Art in Santa Fe where Girard designed a new wing of the museum to house the collection. In addition to Alexander Girard's interior design/branding projects such as La Fonda del Sol, L'Etoile, and Braniff International Airways, he was also well known for his Mid-Century Modern graphic design, textile design, and furniture design, much of which has been reissued and can be purchased today at Herman Miller, Vitra, and Maharam. You can find vintage items by Alexander Girard at 1stdibs.com. For a brief overview of the life and work of Alexander Girard, you can read this article in Hyperallergic about the 2016 Alexander Girard exhibit at the Vitra Design Museum in Germany. For even more information and countless images, you can purchase the Alexander Girard book directly from Ammo Books.